At Marian Pilecki, DDS, we recognize that all of our patients are unique and deserve to receive dental care that reflects their individual needs. Our experienced and talented dental team is committed to working with you and your family and creating a comfortable, friendly and stress-free environment. We find our work rewarding and it’s a pleasure to build and foster our patient relationships. Our patients come in smiling, share stories with us and leave smiling, too. We are here to ensure that our patients have the positive dental care experience at every visit. Dr. Pilecki earned her doctor of dental surgery degree from the State University of New York at Buffalo School of Dental Medicine. She then completed her post-graduate training at the Erie County Medical Center in Buffalo. A member of the American Dental Association, NYS Dental Association and 8th District Dental Society, Dr. Pilecki is also committed to advancing her skills and offering state-of-the-art technology. Last year, she attended a total of 224 hours of continuing education, over 200 of these hours was to enhance her clinical knowledge and skills in TMD treatment and sleep medicine. She has also sought additional clinical and practical courses in dental implants, infection control, cosmetic restorations, porcelain crowns, veneers, tooth-colored restorations (fillings) CPR, and management of soft tissues (gums). Outside of the office, she is married with three children and enjoys biking, swimming, skiing, exercising, cooking and gardening and spending time with her family and friend. Dr. Pilecki takes great pride in helping her patients achieve optimal oral health. By utilizing her expertise and skills in the latest techniques she can help her patients eat, speak and breath better so they can enjoy a longer, healthier life. Welcoming you with warm smiles. We recognize that all of our patients are unique and deserve to receive dental care that reflects their individual needs. 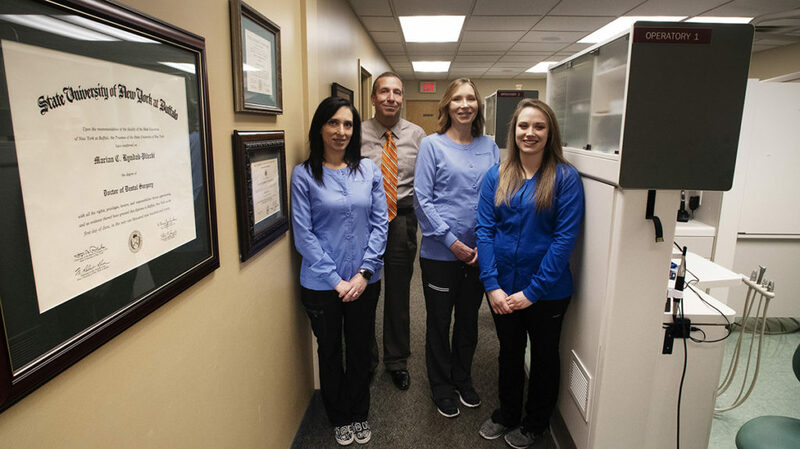 Our team of dental professionals is comprised of a registered dental hygienist, certified dental assistants, and a practice manager with dozens of years of combined knowledge and experience. From the moment you walk in to the moment you leave, we are committed to ensuring that you have a good patient experience in a comfortable and compassionate environment.